Circa 1906. Circa 1906. A local dentist built this historic 9000 sq.ft. Georgian Revival home. 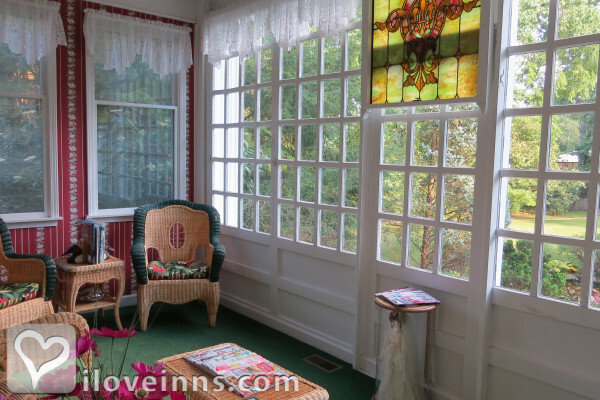 Innkeepers Judy and Gene Denney painstakingly and thoroughly restored the inn, changing the exterior to a cheerful shade of yellow, adding upgrades, and filling the interior with antiques, Oriental rugs, and Victorian appointments. 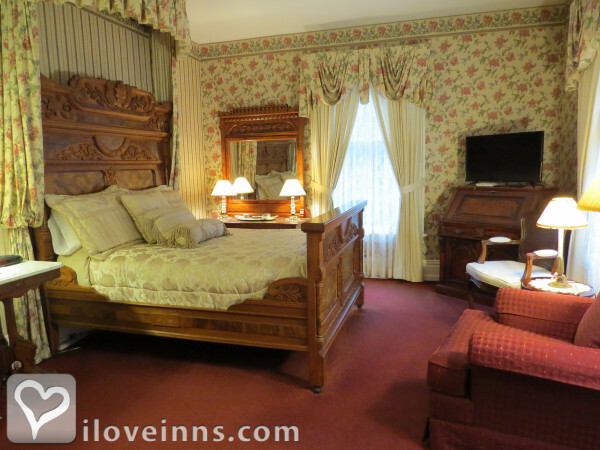 The Lady Anne room has a large private balcony with wicker furniture overlooking wonderful gardens and landscaping. The Denneys provide many thoughtful amenities, including WIFI, fluffy towels and robes. The library is stocked with hundreds of books, and guests relax and read in one of the five public rooms. Guest reviews often include favorable comments about the inn's Strawberry French Toast and Quiche. Located in the West Main Street Historic District, it's a comfortable walk to museums, antique shops, outlets, galleries. Golf courses, wineries, and Summit Motorsports Park and Lake Erie are nearby. 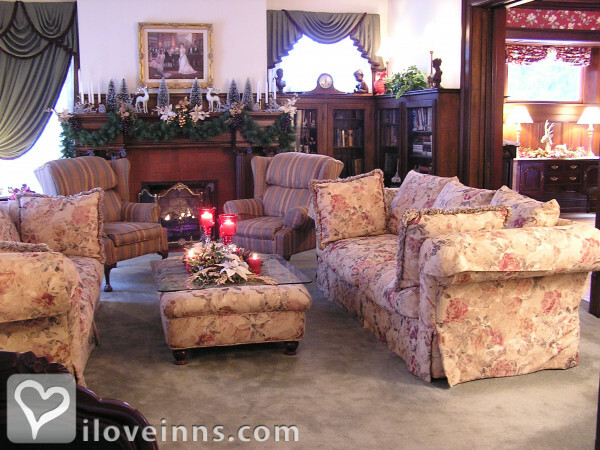 Since the year 2000, the inn has been part of a select small group of Ohio AAA Four Diamond Lodging. Payment Types Accepted Include Visa, Discover, Master Card, Personal Checks, American Express and Diners Club. This property has 4 total guest accommodations with private bath, 1 with fireplace and 1 conference room. The types of beds available include Double and Queen. Nicely 1.3 acres of landscaped grounds with several gardens, a landscape pond, stream and water falls, 32 foot long pergola with hanging vines, large oak, buckeye and chestnut , and sweet gum trees. Most frequently booked room with four poster queen canopy bed, in room sitting area, own private balcony with wicker furniture, two walk - in closets, attached large bath. Only on certain special event weekends such as Finals weekend at Summit Raceway Park Norwalk and Oberlin University Graduation normally over Memorial Day weekend. 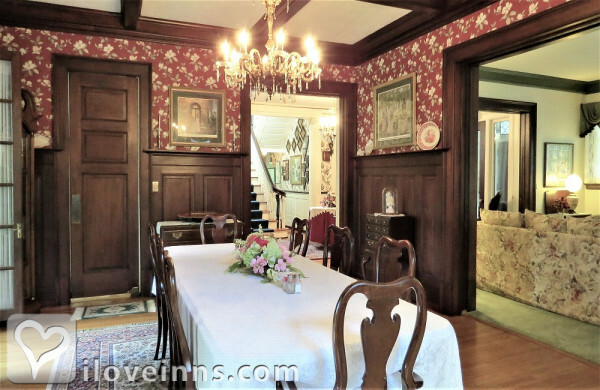 Built in 1906 with upscale trim, moldings, Mahongy trim, solid cherry and oak doors. 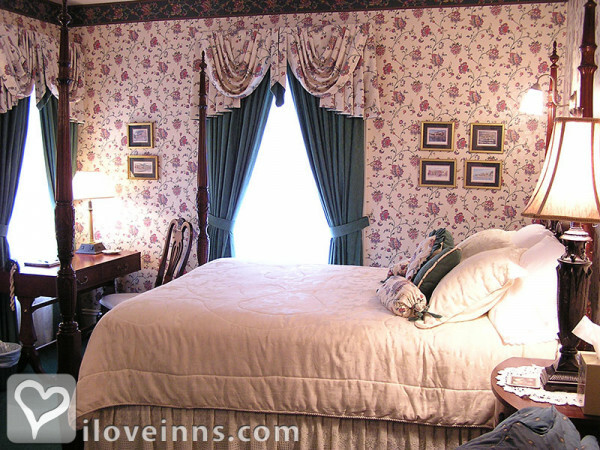 Period full drapes and over 190 rolls of new period wall paper installed by new owners / innkeepers. Our stay at the Georgian Manor was a complete pleasure. We had a beautiful room, enjoyed the common areas with our local friends and had the most generous and delicious breakfasts served on delicate china and crystal in a gorgeous dining room. We loved our stay and highly recommend the Georgian Manor. We loved staying at the Georgian Manor. The home is exquisitely decorated with the finest features and furniture, the rooms are spacious and comfortable and every breakfast was scrumptious and beautifully presented and prepared. Everything was first class and we really enjoyed our stay. Thank you! We'll definitely be back again. 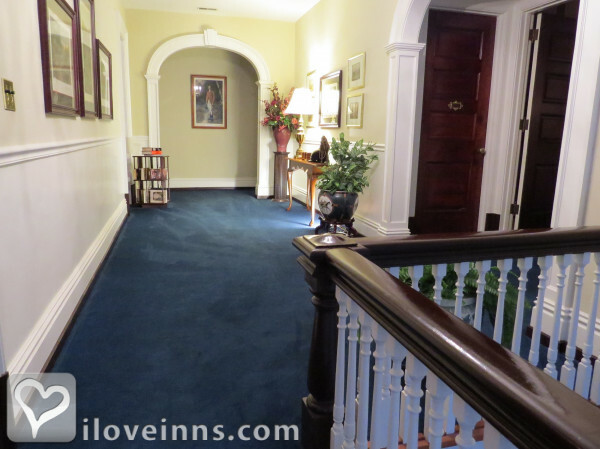 This B & B is a beautiful historical home and we found it to be immaculate and the hosts very informational, helpful, and continually going out f their way to see that we had a pleasant stay. Great place! have been traveling to Norwalk most every quarter for over 20 years for business. I can honestly say that the Georgian Manor Inn provides the best accommodations in the area. The owners, Gene and Judy, are wonderful hosts and serve made to order breakfasts for their guests. The rooms are cozy and comfortable and the gardens are beautiful. If you are staying in Norwalk, stay here. 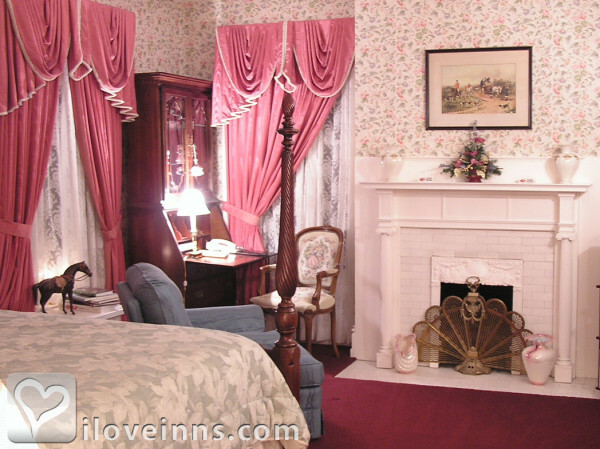 The Georgian Manor Inn is one of our favorite b & b's. It's such a lovely home. Gene greets us as soon as we walk in. He helped us with maps and locating places of interest as well as recommending Berry's in downtown Norwalk, which we enjoyed for dinner. Judy's breakfasts are outstanding. Presented beautifully and taste delicious. This time I relaxed on the screened in porch and on the back patio and enjoyed the flowers in the backyard. We definitely will be back. 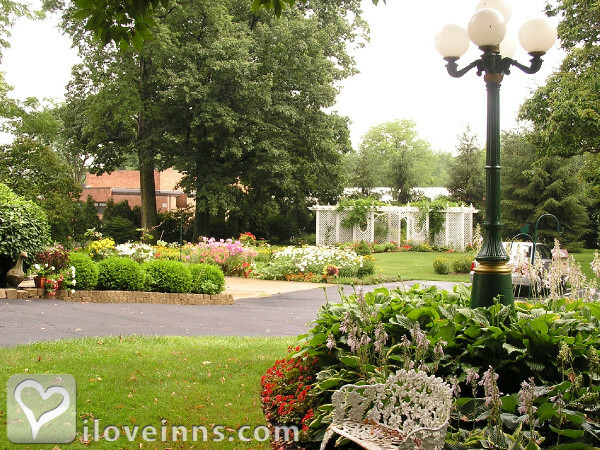 The Georgian Manor Inn is a jewel in the middle of northern Ohio! The breakfast's alone were worth the trip, and the hospiutality of the Inn keepers made us feel more like family than guests. If you have any reason to be in th earea, it would be hard to find a better place to stay. This is a lovely Inn in a beautiful town. The hosts are very nice. My husband and I enjoyed a wonderful stay for the weekend at the Georgian Manor. The innkeepers gave excellent service and went above and beyond in giving us tips on local shopping, restaurants and wineries including directions. The home was perfectly clean and the breakfasts were amazing. It was a pleasure meeting Gene and Judy. We would highly recommend their bed and breakfast. Five stars! My wife, sister, brother-in-law and I stayed at this beautiful Inn this past weekend. We all had a great time visiting area wineries, a fascinating local museum, nearby nature preserve and the marblehead light house. The Inn was fabulous! The hospitality of the innkeepers second to none. Delicious meals and great conversations and to top it off the Ohio State Buckeyes won!! 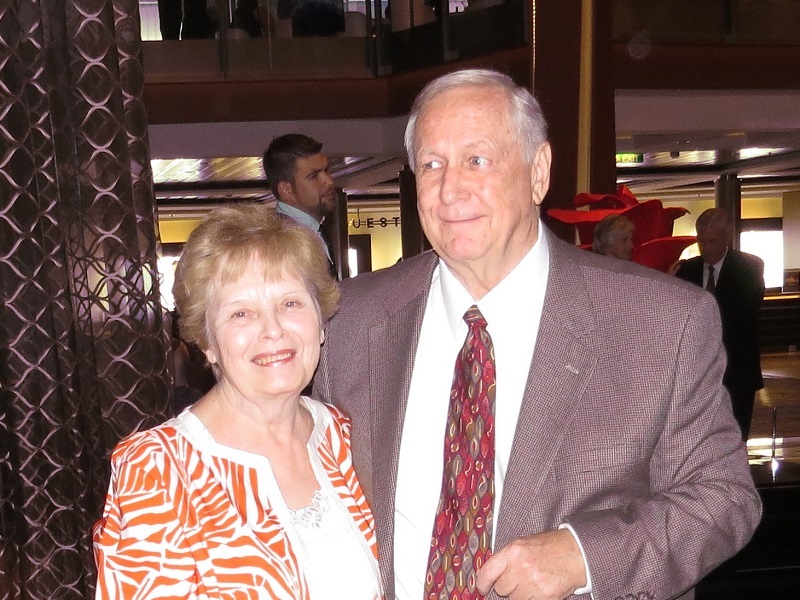 We want to thank Judy and Gene for making a memorable weekend possible. 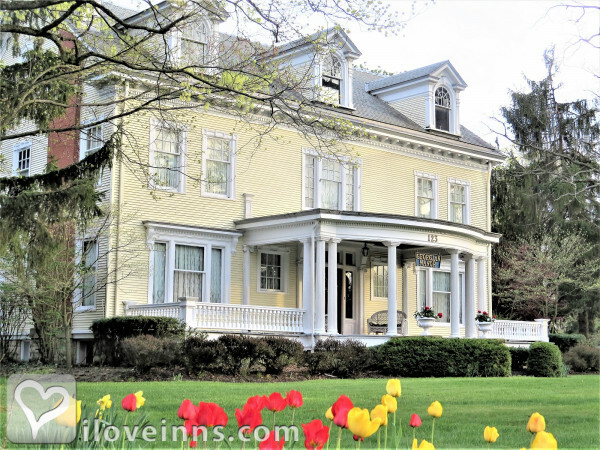 The area around Norwalk is charming, the Inn is beautifully preserved and elegantly appointed; the room was comfy; the hosts were friendly and helpful with good advice about the area, and the breakfasts were beautiful and delicious -- what more could one want from a weekend stay at a B&B? We took advantage of their anniversary special -- a really good value. Highly recommended. This inn is spectacular. We had a very nice time and the hosts were fantastic. The Georgian Manor is a lovingly decorated and well-maintained mansion on Norwalk's tree-lined main street. When we arrived, we were greeted at the door by Gene, who could not have been more gracious or helpful. 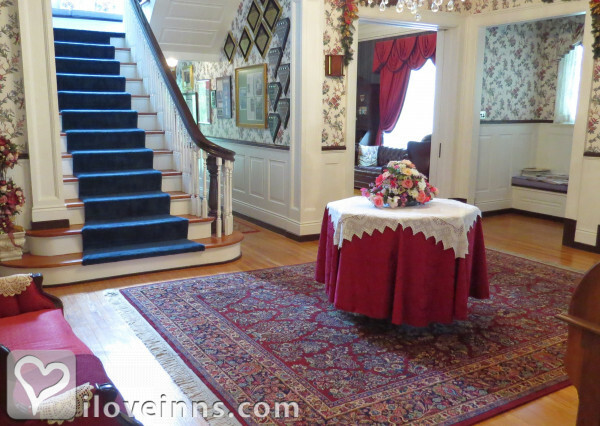 He showed us the inn's inviting public spaces (which, due to our commitments, we were not able to fully utilize - perhaps on another visit), and offered historical information about the house and the surrounding area. (We were visiting family, so did not seek his restaurant and attraction suggestions, but other guests were very enthusiastic when they returned.) Our room, the Lady Anne, was so comfortable. We were able to sit on the porch and look out at the inn's lovely back garden, a gentle waterfall right below us. The room - every inch of the house, in fact - was immaculately clean, and all of our needs were well met. Breakfast was especially fine - Judy's delicious cooking and Gene's kind service made it a great way to start the day. All in all, this is a welcoming, warm and relaxing oasis. 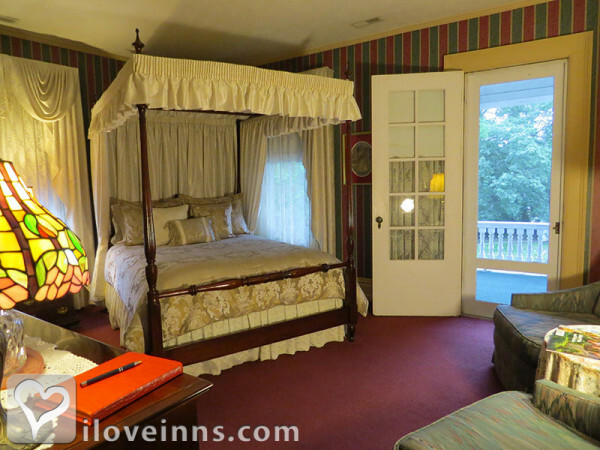 We had stayed several years ago at the Georgian Inn and had a wonderful experience. This time my sister came with my wife and I and we all were , once again, very pleased with all aspects of our stay. All aspects of experience were extremely positive. Had a couple days at the manor, it was very nice and relaxing. My wife and I stayed here as we were in town for a wedding. Unfortunately we weren't really in a position in which to enjoy the Inn due to time constraints, but it was much much nicer than a hotel and only somewhat more expensive. One of the owners, Gene, talked to us a great deal about the house's history and generally made us feel very welcome. The room was lovely and the breakfast was incredibly good! What a wonderful experience to stay at the Georgian Manor. This Triple A Diamond award winning property was immaculate both inside and out. The breakfast prepared by Judy and served by Gene was as tasty and any I have had at a fine brunch. The Denneys are wonderful hosts and I highly recommend a visit to appreciate this beautiful home and their fine hospitality. Our first time staying at The Georgian, the room was clean and elegant. We enjoyed the entire trip. Wonderful place for our wedding night stay! My husband and I were the only couple to stay there for our wedding night, but the breakfast service was phenomenal, the room was beautiful, and we would love to come back for future anniversaries! What a great experience at a great B&B. The Hosts were the best and the rooms were wonderful. We will return in the summer for another visit. Had a special weekend at this sleepy inn. We were impressed with every aspect of our stay. Way beyond the average Bed & Breakfast experience. The innkeepers were friendly and engaging. The food was out of this world. Would highly recommend. We decided to go up early for a church retreat at Lakeside. 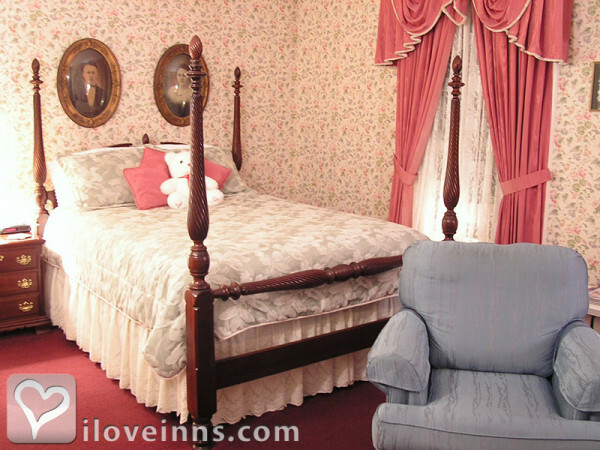 Found this B&B more or less by accident on Bedandbreakfast.com. Great place - we've already booked another stay just because it was so nice - and we're taking friends this time. A beautiful Victorian home with friendly hosts and superb breakfasts! Wonderful spot for a fun girls' weekend! Thanks for making my husband LOVE his first B&B experience. Georgian Manor is gorgeous, and clean, and very welcoming. The breakfasts were delicious and beautifully presented. Our room was clean and very comfortable. We had a private balcony overlooking the lovely garden behind the house. We thoroughly enjoyed the conversations with our hosts and fellow guests. The location was perfect... walking distance to downtown and easy drive to nearby wineries. We hope to go back there again! We had stayed at the Georgian Manor many years ago, had very good memories of our stay, and were happy to have the opportunity to stay again. We spent two nights, which means two fabulous breakfasts! The inn is spotlessly clean, and the proprietors bent over backwards to make our stay perfect. Highest recommendation. Gene and Judy are true gems. Gene most graciously waited up for my late arrival after my drive turned out to be much longer than anticipated. Judy's breakfast of french toast with fruit and sausage links was delicious! The house is absolutely beautiful and very well maintained with plenty of spaces, books to read, a sun room, etc. I only wish I could have spent more time there.